301 pages | 19 Color Illus. | 118 B/W Illus. A flexible, cell-level, and lattice-based technique, the cellular Potts model accurately describes the phenomenological mechanisms involved in many biological processes. 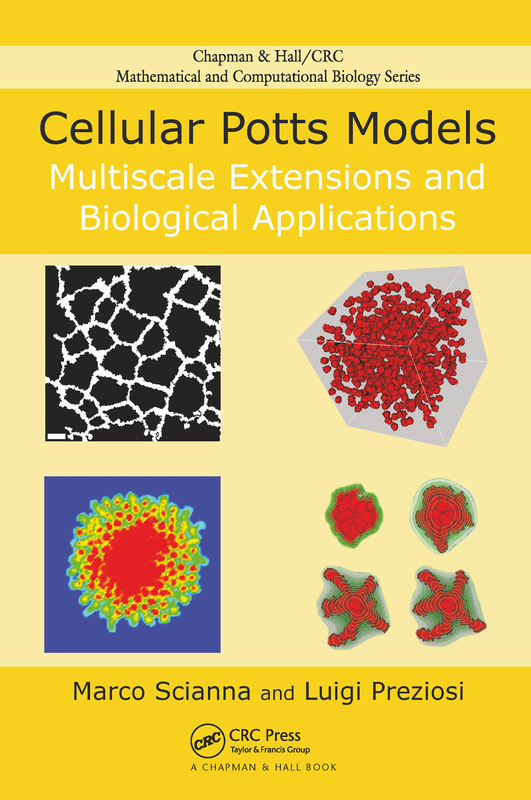 Cellular Potts Models: Multiscale Extensions and Biological Applications gives an interdisciplinary, accessible treatment of these models, from the original methodologies to the latest developments. The book first explains the biophysical bases, main merits, and limitations of the cellular Potts model. It then proposes several innovative extensions, focusing on ways to integrate and interface the basic cellular Potts model at the mesoscopic scale with approaches that accurately model microscopic dynamics. These extensions are designed to create a nested and hybrid environment, where the evolution of a biological system is realistically driven by the constant interplay and flux of information between the different levels of description. Through several biological examples, the authors demonstrate a qualitative and quantitative agreement with the relative experimental data. The cellular Potts model is increasingly being used for the mathematical modeling of a wide range of biological phenomena, including wound healing, tumor growth, and cancer cell migration. This book shows how the cellular Potts model can be used as a framework for model building and how extended models can achieve even better biological practicality, accuracy, and predictive power. Marco Scianna is a post-doctoral fellow in the Department of Mathematical Sciences at the Politecnico di Torino. He earned a Ph.D. in complex systems in post-genomic biology from the University of Turin. His principal research focuses on mathematical multiscale models applied to biological and biomedical problems, with particular interest in the context of tumor growth, vascular network formation, and cell migration in extracellular matrix. Luigi Preziosi is a professor of mathematical physics at the Politecnico di Torino. He earned a Ph.D. in mechanics from the University of Minnesota and in mathematics from the University of Naples. He has authored three books, more than 30 book chapters, and more than 100 articles in international journals. His recent research interests include multiphase models of tumor growth, the mechanics of tissue growth and regenerations, cell migration, and vascular network formation.